The Sule pagoda is a stupa right in the center of Yangon, apparently by design, since the British city was built long after the stupa was established. The Family elected to go inside, whereas I took a walk around it. Visitors to the stupa climb a set of stairs before they can see anything. At the road level, below where the devout throng, lies an interesting commercial world. 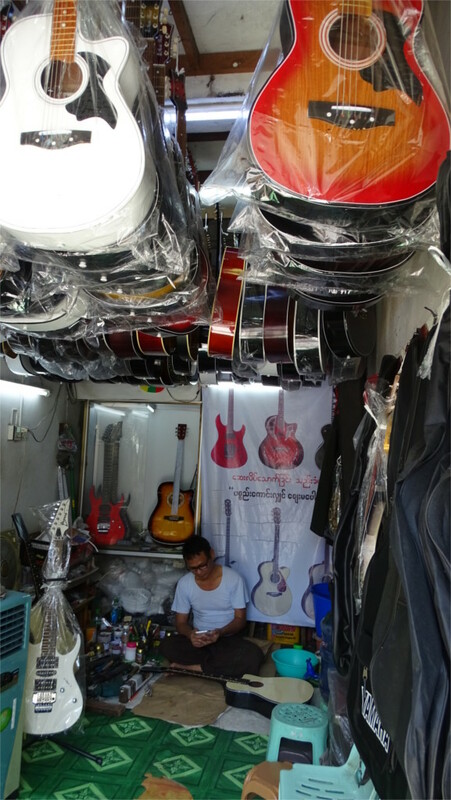 The first interesting shop I spotted contained guitars. The stupa was a futile hiding place for revolutionaries in the uprisings of 1988 and 2007. I heard from survivors of both generations about their experiences under the military dictatorship. None of them talked about the shops below the pagoda. I guess guitars did not play as much of a role as in the mild rebellion which threw up this year’s Nobel laureate in literature. Myanmar’s rebels had an altogether harder time. If you happen to be in Myanmar, you might find it useful to seek out survivors of the revolutions and the bloody pogroms which followed: we who live in democracies could learn a lot by listening to such people. One young man told me a joke which got three brothers arrested and tortured. A man goes from Myanmar to India to see a dentist. The Indian dentist treats him, and then says that it was a simple procedure, and perhaps the patient could have tried to consult a dentist in Myanmar. The patient says he couldn’t because he is not allowed to open his mouth. The framing of the story was ironical, but it drove home the point. A third of the circle down I came across a photographer who owned a cabinet full of old cameras that he had labelled a camera museum. I had a little chat with him: I’m always happy to talk to photographers. He spoke good English, and told me that digital cameras were extremely expensive in Burma till about five years ago. But now smart phones and digital cameras are coming into the country fairly freely. We did see evidence of this in the form of people glued to their phones at odd places. 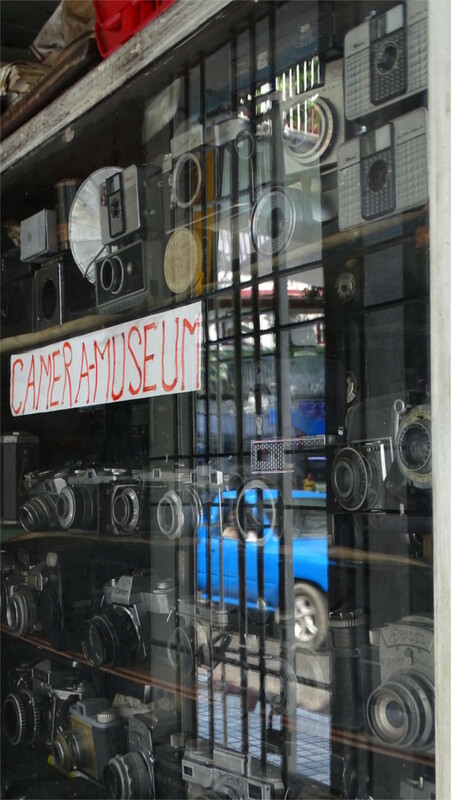 The museum was interesting to look at: all photographers have this in common. Then there was a line of three or four astrology shops. They were empty of clients in the middle of a morning. I asked one man whether I could take a photo, and he readily gave me permission. Others were more keen to tell me of my future. I declined; I like my future muddy. At one of the entrances to the pagoda I came across two ladies with baskets of birds. Apparently you can buy a bird and release it to gain merit. Wonderful commercialization of religion: one person racks up demerits in the next world and money in this, whereas more gullible people do the opposite! Eventually both The Family and I were happy going round the stupa. I got a glare when I suggested that I was more down to earth. No, the right way to say this is that she was closer to heaven. Don't hold your breath Blog at WordPress.com.